Known as a ferocious freshwater fish, the Piranha is a small to medium size fish native to lakes and rivers in South America. Some have been found to inhabit warm bodies of water in North America and in the Kaptai Lake in Bangladesh. They are infamous for their razor sharp teeth and extremely powerful jaws. 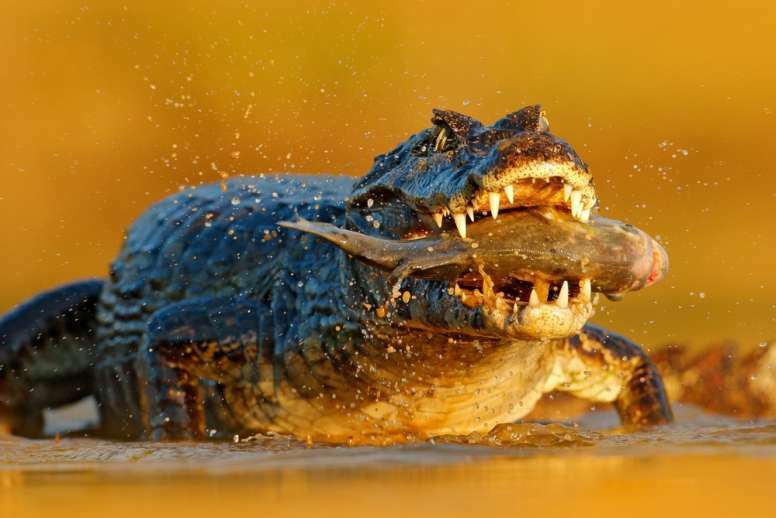 Predators: Crocodiles, Caimans, River Dolphin, Turtles, Birds & Other Larger Fish. There is believed to be somewhere between 30 and 60 different piranha species. However, the exact number is unknown, debated and not yet scientifically proven. There are over 20 different species found in the Amazon river alone. The average size of a piranha is 6 to 10-inches in length however, some have been recorded to measure up to 20-inches in length. The famous red-bellied piranha species has a silver colored body that is covered in red patches, but other piranha can have shades of yellow, green and black. This provides a form of camouflage in the muddy waters these fish live in. 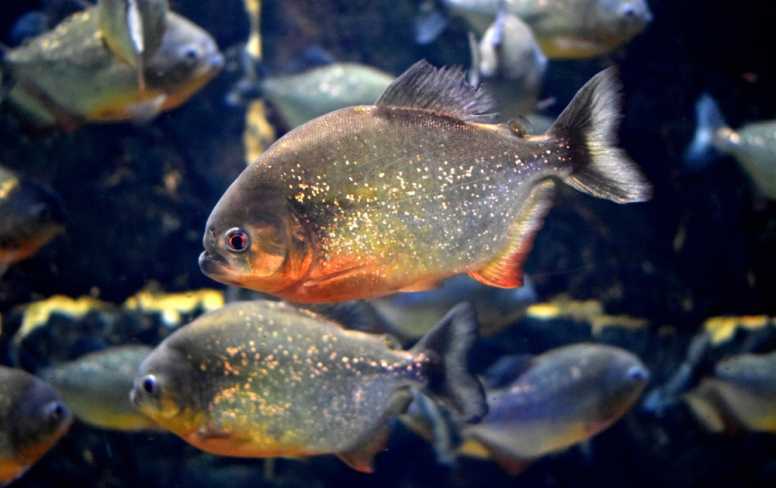 Thanks to the work of Hollywood, many seem to believe that piranhas have an insatiable diet for blood, but as it turns out, they are actually omnivores – they eat animals and plants. Some species are also thought to be vegetarian. The 1978 movie titled simply “Piranha” got it all started and even had two sequels that followed. Piranha II – The Spawning (1981) and Piranha 3D (2010) pretty much scared anyone who wasn’t affected by Jaws. The diet of the piranha usually consists of fish, snails, other aquatic animals, plants, seeds and fruit. Should a mammal or bird fall into piranha infested waters, these busy little fish will devour them in a group, but this isn’t a frequent occurrence. 1. They have razor sharp teeth, with tooth enamel structure similar to that of sharks. The piranha has a single row of triangular teeth that are razor sharp. They will lose teeth throughout their lifetime and they will be replaced. 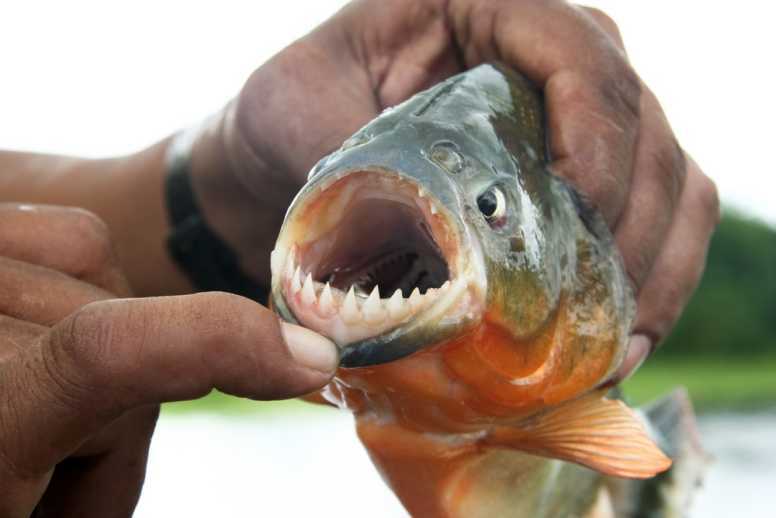 The way in which their jaws are designed leave piranhas with a very distinct under bite, which means the bottom row of teeth are always exposed. 2. Piranha need warm water to survive. As opposed to requiring warm blood – thanks to the world of horror movies – piranha can’t live in water that is less than 54-degrees F.
3. Theodore Roosevelt is thought to be somewhat to blame for their reputation. 4. The word ‘piranha’ actually means “fish tooth” in Amazonian indigenous languages. It is a rather descriptive name considering the teeth and mouth of the piranha. 5. Piranha live longer in the wild. In the wild, piranhas have a life span of up to 25 years. In captivity, they only live between 10 and 20 years. 6. There is one common aquarium piranha. The red-bellied piranha (Pygocentrus nattereri) is the most common of the species that you may see on display somewhere. 7. They have a sensitive nose. Piranhas have what has been described as an “amazingly acute sense of smell” and this is what helps them in locating their next meal. It comes in handy as their eyesight is likely poor in the murky water piranha tend to like spending their time in. 8. A fish, is a fish, and piranhas are not much different. The piranha respiratory system is the same as any other fish. They take water in through gills and absorb the oxygen that exists in that water. The oxygen is fed to the bloodstream and once all the oxygen is used up, they expel carbon dioxide through the gills. 9. Two types of piranha can be more dangerous to humans. The black and the red-bellied piranha can be aggressive towards humans, although actually attacking a full grown adult is highly unlikely and more myth, than fact. 10. For relatively small fish, they have powerful jaws. The piranha jaw is strong, with the largest in the species being able to bite with a maximum force of 3 times their own body weight. The black piranha has the strongest bite force recorded for bony fish, according to a 2012 study by scientist Justin R. Grubich. If bitten, a piranha can cut through a human hand in minutes. 11. The piranha can devour large animals. As stated above, only if the animal happens to fall into water infested with piranha will it become dinner. The main reason this happens is because piranhas hunt in groups – very large groups. 12. Don’t worry about being eaten by hungry piranha. Piranhas rarely attack humans. Fatal attacks are even rarer, and most recorded cases have been where humans have already drowned. 13. The male plays a huge role in the reproductive cycle. A female piranha will lay about 5-thousand eggs. The male’s job is to fertilize them. But that’s not where his participation ends. The male piranha will take this job so seriously that he will become territorial of the eggs and will protect them however he has to. 14. The piranha reproductive cycle is fast. There are two spawning a year for piranha. The first one takes place in spring with the second in the late summer. 15. Humans have found a use for the piranha. You’ve heard the saying, fighting tooth and nail, right? Well, native cultures in South America have used and continue to use piranha teeth for both tools and weapons. 16. Careful if you are hoping to buy a piranha as a pet in an aquarium. Piranhas can be bought for this purpose but check your local laws as in most places it is illegal to possess one. 17. They have been with us for a very, very long time. 18. They hunt in groups, & go for the tail and eyes. 19. Researchers argue they stay in groups for safety and protection, rather than for attacking prey. 20. The movies have given piranhas a bad rep.
Generally speaking, these fish are actually quite shy and are considered non-aggressive. However, when protecting eggs or their young, you may see a slightly different side to these fish. 22. Piranhas found in Bangladesh and China has researchers scratching their heads. The discovery of piranhas so far from their native habitat has been a cause for concern for several years. However, no clear answer has been given as to how this could have happened, although they are thought to have been illegally brought into the country. N. Hubert et al (2007). “Phylogeography of the piranha genera”, via US National Library of Medicine. R. Foxx (1972). “Attack preferences of the red-bellied piranha”, via Science Direct. H. Queiroz & A. Magurran (2005). “Safety in numbers? Shoaling behaviour of the Amazonian red-bellied piranha”, via NCBI. S. Millot et al. (2011). “Sound production in red-bellied piranhas (Pygocentrus nattereri, Kner): an acoustical, behavioural and morphofunctional study”, via Journal of Experimental Biology.